Between cramped seating and disappearing amenities, it feels like you have to claw your way to the smallest victories in economy air travel. But sometimes, major airlines can surprise you. 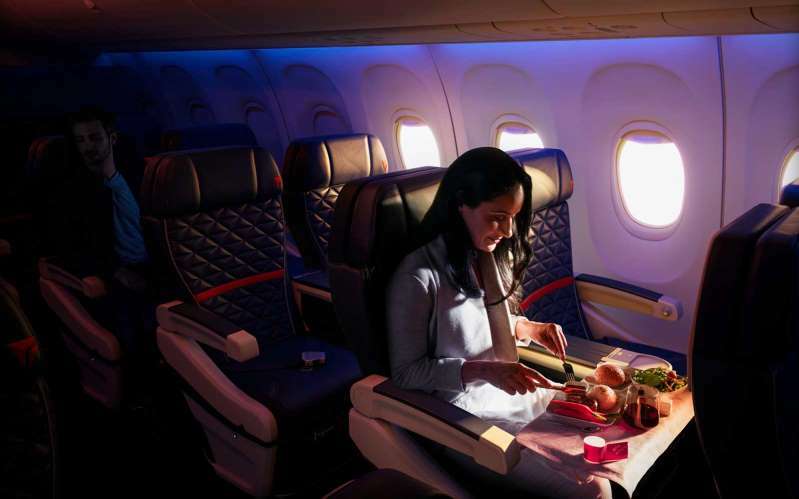 Passengers flying Delta between Portland, Oregon and Tokyo, Japan will be part of the airline’s new test to bring three-course meals to economy passengers, according to Chicago Business Journal. [post_ads]Attempting to make a long-haul flight feel a bit more luxurious, the airline is testing out a new restaurant experience in the main cabin. Upon takeoff, economy passengers will receive “Welcome Bubbles,” their choice of three Bellinis or sparkling waters. When it comes time for meal service, passengers receive a printed menu detailing choices. Appetizers could include quinoa salad or roasted grapes and pine nuts. Entree options include pasta with cauliflower and walnuts in a cream sauce. For dessert, there could be something like Haagen-Dazs ice cream. Each course is served separately. Instead of small, microwaved metal tins, meals are served on white dishes with white cloth napkins. There is still plastic cutlery, but it’s nicer than the flimsy tools that usually come wrapped in a plastic bag. If the tests are successful, Delta could roll out the meal service to other long-haul international flights by the end of the year.